Shop NYX Professional Makeup Retractable Lip Liner Natural (.01 oz. ).01 oz. 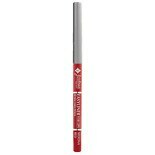 Shop Jordana Easyliner for Lips Retractable Pencil Sedona Red (.01 oz. ).01 oz. 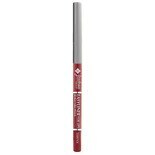 Shop Jordana Easyliner for Lips Retractable Pencil Tawny (.01 oz. ).01 oz. Shop Jordana Easyliner for Lips Retractable Pencil Baby Berry (.01 oz. ).01 oz. Shop Jordana Easyliner for Lips Retractable Pencil Pink Love (0 oz. )0 oz. Used to define the lips, retractable lip liner can help your lipstick look expertly applied by keeping it from feathering outside the lip line. Some lip liners can last throughout the day, while others can moisturize your lips or fill in fine lines. Retractable lip liner even sharpens itself, so it's ideal for convenient touch-ups on the go. Choose your shade of lip liner pencil from brands Jordana, Black Radiance and more here at Walgreens.com. Besides retractable lip liner, there are many other forms of lip makeup to try, including lip stain, lip gloss and lip plumper. All of these items can help condition and color your lips to help achieve your ideal look. Browse our selection of cosmetics, including those from popular brands Revlon, L'Oreal and CoverGirl. From foundation and pressed powder to eyeshadow and mascara, you'll find makeup for many skin tones and types. There are even makeup applicators, from cosmetic brush sets to cotton swabs and makeup wedges.